‘The Highbury of today is the best possible tribute to Herbert Chapman and the Arsenal of yesterday. Even today it is a temple of football. The present West Stand was opened by the Prince of Wales (later Edward VIII) in December 1932. The East Stand, the one the players come out of, was quietly opened before a match with Grimsby Town in October 1936. Even today it is a temple of football… It is hard to imagine how any young player who visits Highbury can avoid coming away with the impression that Arsenal is the club. Hardly surprising for a club steeped in tradition and success that Arsenal’s playing record at Highbury was formidable. 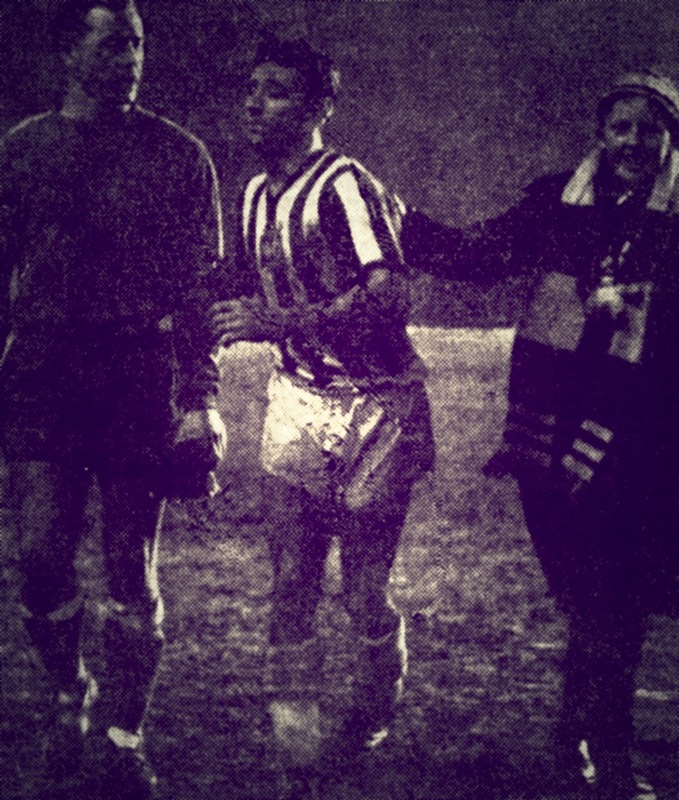 A home defeat sometimes happened, but a thrashing was rare. At the time, Arsenal’s record home defeat was 0-5 by Huddersfield Town in February 1925. It was a scoreline to be emulated by Chelsea against a young Gunners side in the League Cup in November 1999. Given this, Arsenal apart, it is hard to find in the record books which other club has scored six goals at Highbury… apart from Brighton! 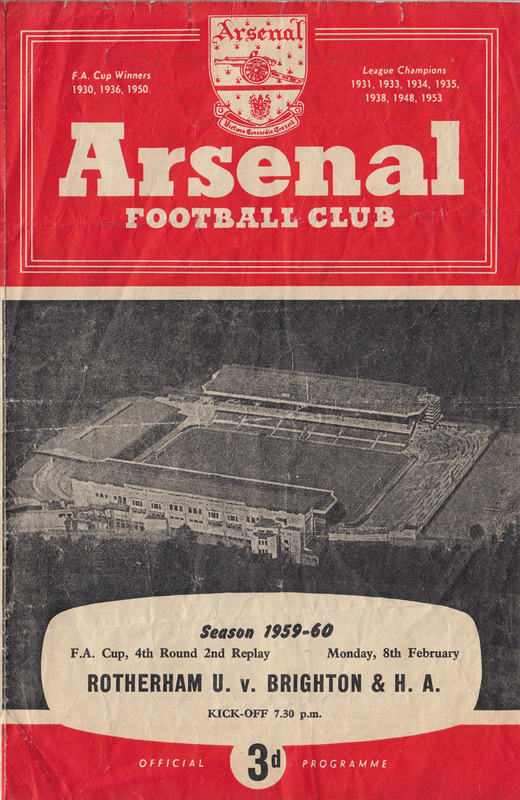 Ten years before Arsenal began their ‘double’ season, Brighton drew Rotherham at Millmoor in the FA Cup fourth round in 1960, having won at Bath in the previous round. While the Millers and Albion were both in Division Two, promotion candidates Rotherham were the undoubted favourites. 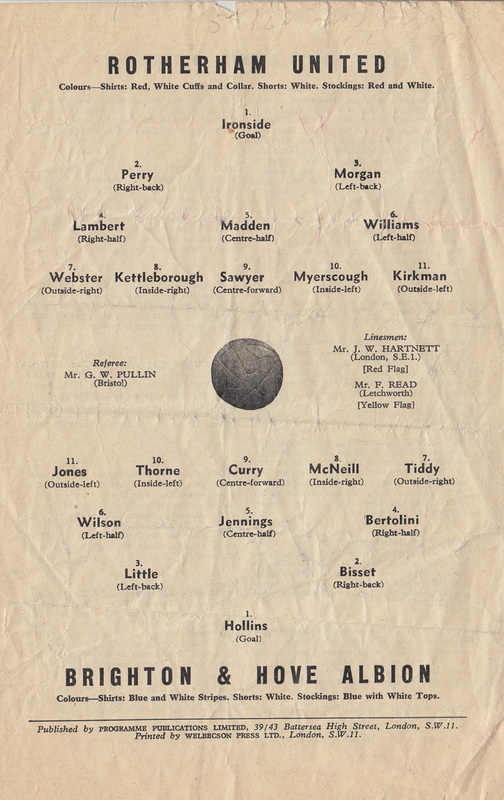 Indeed, in the previous round the Millers had sensationally knocked out Arsenal after three matches, drawing 1-1 at Milmoor and 2-2 at Highbury before triumphing 2-0 at Hillsbrough. Oh, how the floodgates opened! Adrian Thorne, who got both Albion goals in the first two matches, opened the scoring again. Brighton led 2-0 at half-time before a glorious spell of three goals in seven minutes early on in the second half turned the match into a famous triumph. 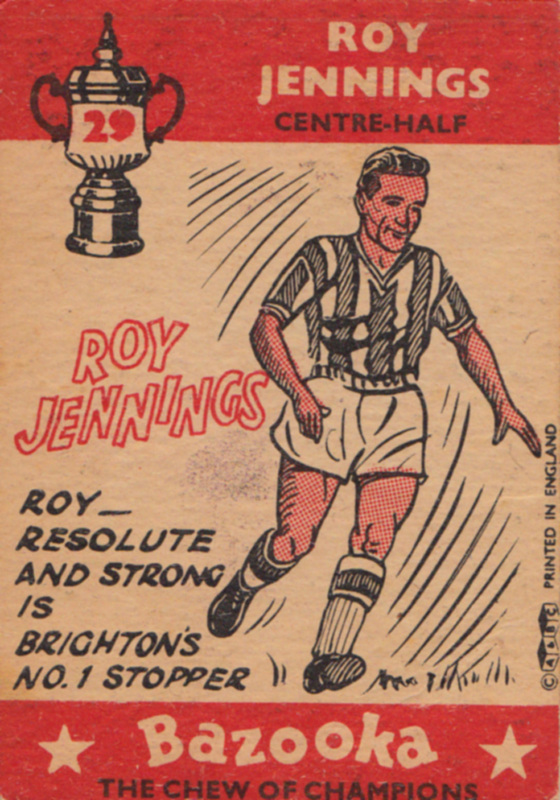 Not least for Bill Curry, who hit a hat-trick or, indeed, outside-left Freddie Jones, who had joined Brighton from Arsenal in 1958 and scored on the night. Rotherham’s Ironside gets caught up in Brighton’s celebrations. Here he is with Curry and a delighted Brighton supporter. Brighton went down 2-1 at Preston in the next round, but nothing can take away from their feat of scoring six goals at Highbury, home of the Marbled Halls. It was better than anything that Arsenal managed that season.